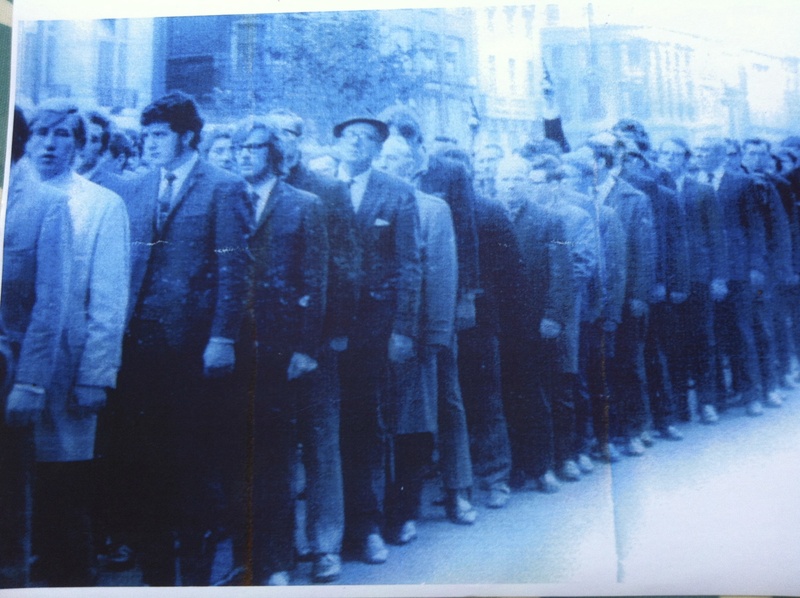 Photos from the 1970 funeral of Liam Walsh (Saor Eire) | Come Here To Me! « Where are they now? Robert, Stephen and Russell at Nelson’s Pillar, June 1959. 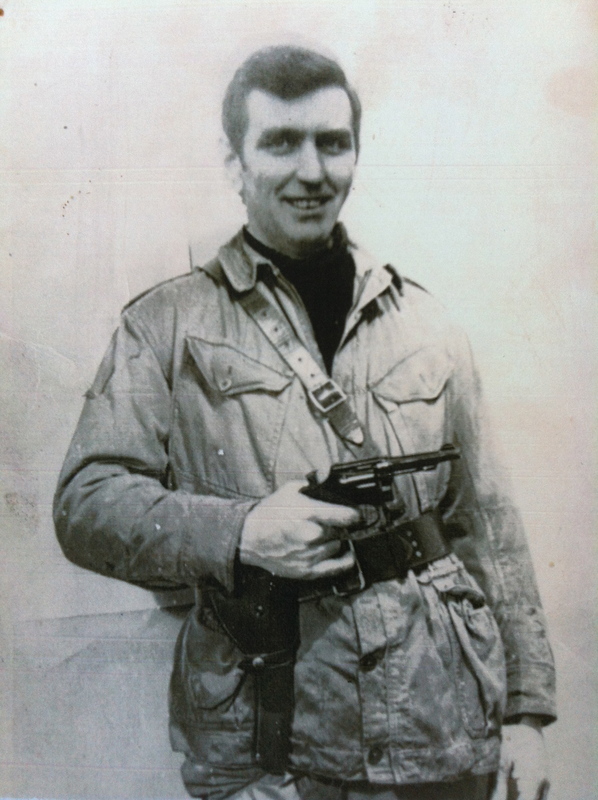 On 13 October 1970 Saor Eire member Liam Walsh, a welder and fitter by trade and father of four, was killed in a premature explosion when himself and another member Martin Casey were planting a device at a railway line at the rear of McKee army base off Blackhorse Avenue in Dublin. Joining the Republican Movement in 1953, Walsh had been the commanding officer of the south Dublin unit of the IRA during the late 1950s and was interned for a time in the Curragh. He lived at 50 Tyrone Place, Inchicore and, at the time of his death, was awaiting trail on charge of taking part in an armed bank raid at Baltinglass in August 1969. Liam Walsh in IRA uniform. Photograph belonged to the late Paddy Browne. We have been passed on some photographs of his funeral by Barbara O’Reilly. 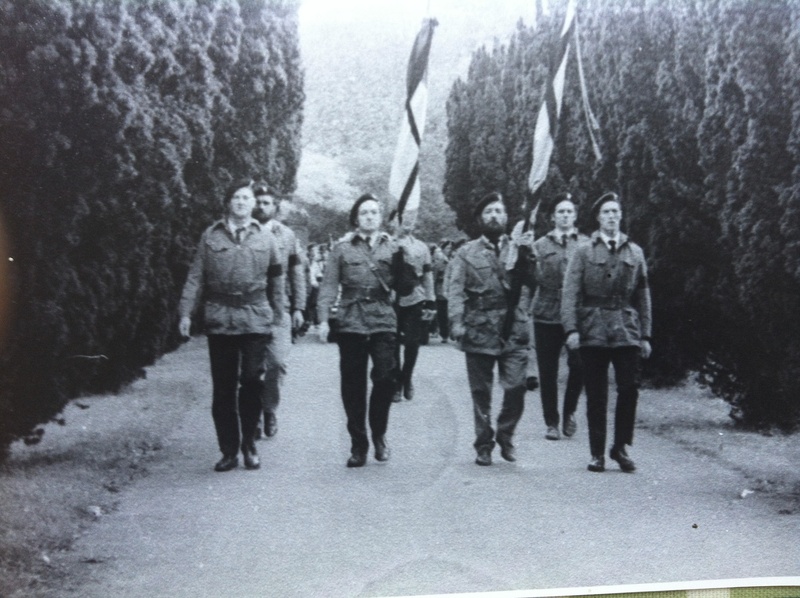 The photographs belonged to the late Paddy Browne who can be seen in the third picture with beard carrying a flag at the front of the colour party . The funeral took place on 17 October 1970 and was attended by over 3,000 people. The cortege left from Inchicore, was diverted down O’Connell Street and marched all the way to Mount Jerome cemetery in Harold’s Cross. 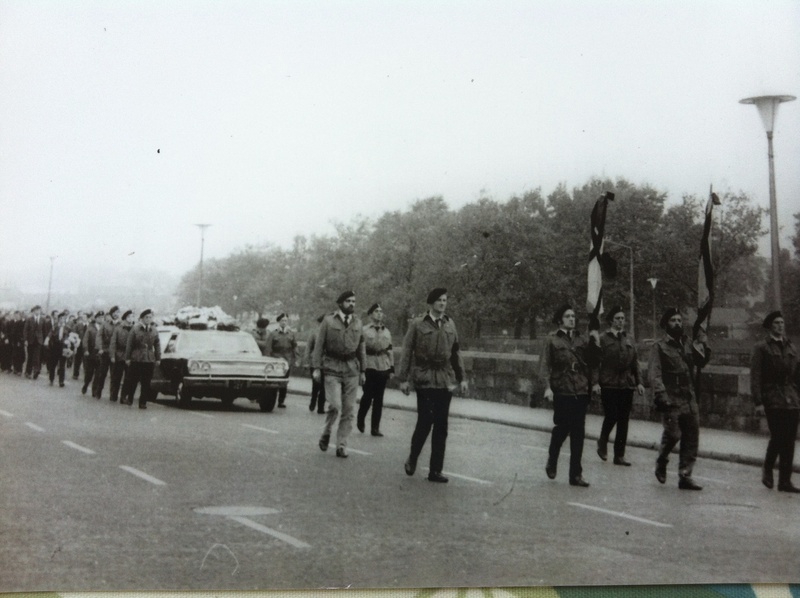 Here is the cortege as it made its way down O’Connell Street. Note the two hands with revolvers. Two men, dressed in black berets and anoraks, fired four rounds of ammunition into the air as a tribute to the dead man. An estimated 50 gardai and a dozen special branch accompanied the cortege but no action was taken. Here is the colour party as it entered the cemetery. The Irish Times (19 October 1970) reported that an elderly man shouted ‘So long soldier!” as his coffin was being lowered. The revolvers can be seen in the top, middle section. Interesting pictures. So basically this guy blew himself up while planting a bomb in his native city designed to inflict loss of life and limb on his fellow Dubs and got a joyfully heroic funeral. Sam, interesting photos from the Liam Walsh funeral is this a first for them to be published? Liam Walsh (Saor Eire) was killed in a premature explosion preparing a bomb at the rear of McKee army base, off Blackhorse Avenue in Dublin. On a railway embankment well away from anyone ,when there were no trains running. This operation was carried out as a publicity stunt to draw attention to the plight of the nationalist in the north in 1970 that went very wrong. Very interesting public Meeting will take place in the Cobblestone Pub Smithfield on Thursday 12th September, 7.30 pm, entitled Radical Politics of the late 1960s-70s Marxists- Anarchists & Saor Eire. Speakers: Alan MacSimoin a former member Workers Solidarity Movement and John McAnulty former People’s Democracy Belfast City Councilor. Following the contributions of each of the speakers, there will Q&A session. Interesting photographs, but cover story inaccurate in two ways. Firstly, Liam was not preparing a bomb, He was trying to defuse a bomb that had been left on the line probably by Loyalist paramilitaries. Secondly, he was being assisted in this work by SE Volunteer Mairin Keegan. Though she survived the explosion apparently unhurt, it is believed that the shock triggered the revival of the cancer that would kill her fifteen months later. The Irish Times and other newspapers named Martin Casey as the person who was with Liam that night. Is this a mistake on their part? Can you clarify what happened? The paragraph on in the incident in the article on ‘theirishrevolution’ is quite confusing. Sam, Saor Eire member Mairin Keegan brother told me that she also assisted Liam Walsh on the night he was killed in a premature explosion, the Irish Times would not have known this. Walsh preparing the bomb to be handed over to the activists, including Mairin Keegan they were an active service unit of Saor Eire. To my knowledge, there were three from SE present when the bomb went off. Liam Walsh was killed instantly, Martin Casey injured badly and needing several months in hospital (hence public identification) and Mairin Keegan who seemed to have been unscathed, but who was probably suffering from shock which triggered her premature death. Rayner I accept you are correct when you say there were three from Saor Eire present when the bomb went off killing one of them. Frank Keane told me the operation was carried out as a publicity stunt to draw attention to the nationalist in the north: on a railway embankment out of the away so no one would get hurt. Rayner you were at the Walsh funeral when Gerry Lawless gave the oration, do you remember what he said? Would anybody have a photograph of Liam Daltun Saor Eire- International Marxist Group who died in London 1972. I would have a few photos of Liam Daltun (speaking in public, etc.) if you’re interested. How can I get in touch with you? Thanks for sharing. Very interesting times when people believed they could make a difference. Eamonn-that is great news that you have photographs of Liam Daltun. Will have to scan them etc., so give us a few days or so. Another of a series of interviews with figures from the Irish Left. This is part one of an interview with Jim Lane. Lane was in Saor Eire (Cork).Part two Jim talks about Saor Eire. Liam Sutcliffe gives his account,on the Liam Walsh photo that is not Walsh? on February 26, 2014 at 11:38 am | Reply Incidents in Dublin during the Troubles (1969-1994) | Come here to me!